Oh how I love a great trouser. Sounds a little crazy; but back when I was working in an office setting, wearing a power suit / outfit on the outside, had a way of making me feel powerful on the inside. Now that I’m a Stay at Home Mom and Style Blogger, I realize EVERY woman deserves a power suit, and I’ve just found the #1 Trouser for your Wardrobe whether you spend your morning battling rush hour, or school drop off. Versatility is key for any woman’s wardrobe, and by that I mean pieces of clothing you can wear day or night, or better yet, day TO night! Here’s a few ideas of taking these pants both business and casual. I paired them here with a super flowy green button up, and my black and gold sequined heels from Aldo. I wore this outfit to the Harvey Nichols x Harpers Bazaar Spring Summer 2019 Style Event at Mall of the Emirates! It’s a tiny bit flashy for me; but I was feeling the green with the red and white stripes! A classic white button up, tucked in, with a pair or leather heels, either white or black would be predictable; but even a pair of metallic pointed toe flats. For the stylish mom’s on the go, I’d say grab a classic white T, I’m thinking V-neck, a little slouch, and a pocket for detail, paired with a fun denim jacket and fashion sneakers. 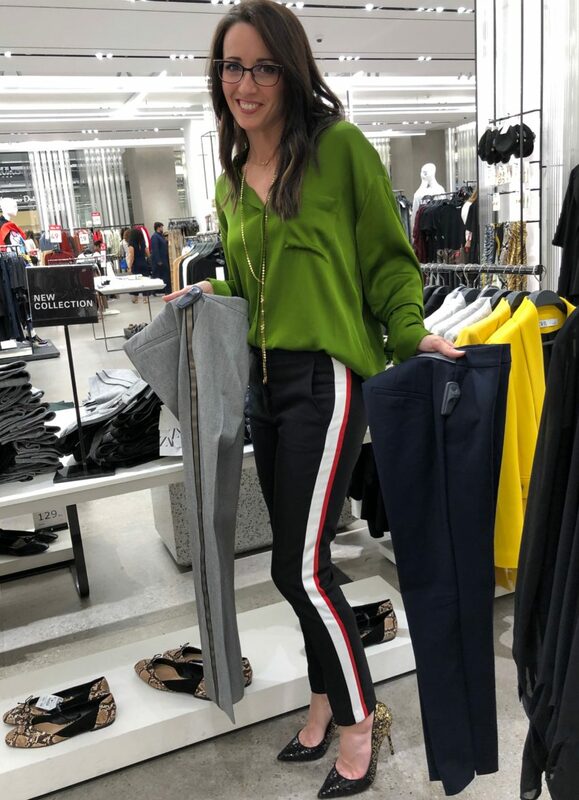 Finally we get to why I feel like these trousers really are holding the #1 spot for my fashion finds of Spring Summer 2019. Slim fit; but not skinnies. A cigarette pant creates a really long lean line. Vertical detail down the leg also lends to a tuxedo look, which lately has been worn both dressed up or down. Ankle length. I’m 5’4″, so for taller gals this is going to hit a bit higher than the ankle, and the opposite is true for shorter, so keep that in mind when trying on. Pockets. Enough said there, am I right?! Faux back pockets. It’s a detail that adds a more custom look, like there’s more work to the garment. Stretchy material. THIS is a huge reason why it these are great for everyone! Moms on the go need comfort and pants that GIVE, just as much as women who are sitting at a desk, running to different departments, and everything in between. This is the best part….the stetchy waistband! The front is a classic trouser closure with a zipper and a clasp; but he back is elastic! Not the bunched elastic like our grandmother’s pants; but a great band that doesn’t sit too tight / dig in and still allows your tucked in shirt to stay put. Happy Shopping Ladies! If you DO give these trousers at try at a Zara nearest you, I’d love you to drop a comment and let me know what you think!